A clue about our destiny, happy summer holidays for everyone. 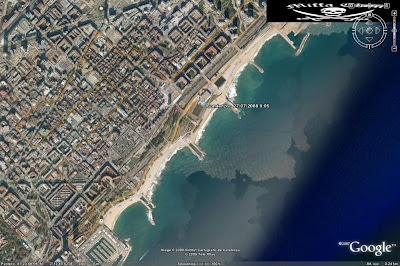 In a few hours we will flying from Barcelona to the Netherlands, from there to China where we will stay for a few days – you can’t imagine how difficult is travelling to China during this weeks- and then our final destination. A wise or unwise way to travel, if you consider time or if you consider money, but still a way to travel long distances. FB and me have the aim to conquer Mt. Cook, but may be the weather won’t be the right one or may be I will decide to change our plans. Anyways another territory explored by your orange cap preferred bunny. PS: I am carrying my computer with me for the very first time, in this worldwide crisis scenario I would like to know –at least- if they are counting with me when returning home or if they will just fire me. 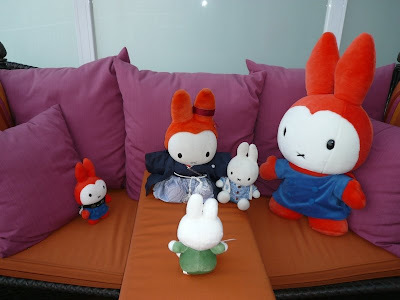 Miffa is a member of The Supreme Council for The Bunny Attitude but as you might imagine the council is formed by many different bunnies that represents different parts of the world, different races, and of course who have different visions of the future bunny world. 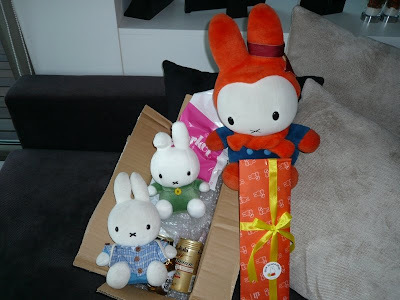 As I have told to my daughter a lot of times one of the most widespread rabbit is the European Rabbit who has his origin in the Iberian Peninsula. 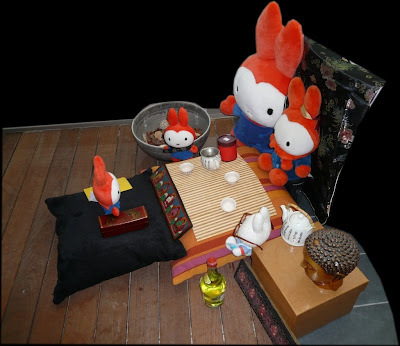 Anyways, she decided to become a Buddhist Bunny and to create her own sect inside it. As time passed by Draculina, Ookina and new members of the orange cap joined her and they have developed their own rules and culture. 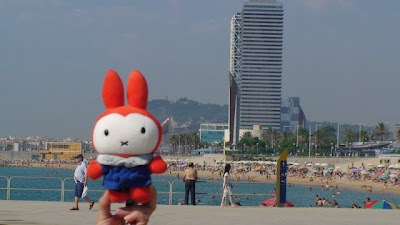 Yesterday Draculina’s twin sister arrived from Hong Kong after a real nightmare finding her way from Madrid to Barcelona. 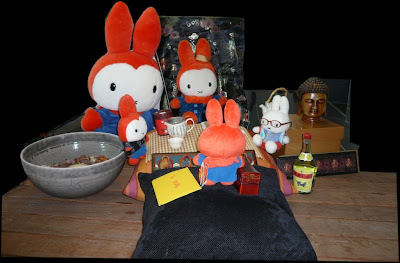 She has been sleeping all the day long until 18:00 when Miffa, Ookina, Draculina and Miffu (the only no orange cap member accepted) were waiting to have tea. The ceremony ended about 21:00 when Draculina’s twin sister has received her new name – Draculina J- and, after reading the letter 9j wrote, she was nominated as a new sect member. Of course 9j is a member of the sect and the council. As Miffu, she is from Hong Kong and this is just enough to become a member if you pass the severe test and trials. You don’t need to wear that orange cap that – of course- denotes certain grade. Damn, Father Bunny blasted me! may be the secret to achive a good race. Our race # 819. I have the feeling that he has been training secretly and using illegal tricks to beat our 45:00 barrier. After a hard last race – after a hard night party I organized to neutralize his training- that ended with him and my sister Draculina stopping the chrono at 0:45:05 but suffering as they were in the lungs of hell in the second half, I raised the bar and I asked for an under 44:00 minutes. He trained with 35 Celsius past Friday and Sunday for 16 and 21 kilometres (he wants to do a half marathon in September). As ever before the over train factor was important and we thought that he will broke due to an extreme treadmill exercise made in 0:43:48 with the second half running over 14 kph. Lot of ice, lot of complaints but lot of muscle gained in his quadriceps in two weeks. Damaged but not so much. Last game of the season, The Eurogames – surely too early, too hot, but his last chance to win- a non profit event organized by the European Gay & Lesbian Sport Federation opened to everyone that promotes integration and non discrimination between gender and sexual orientation. An event with athletes from all over Europe that will raise the level of the previous races. The race, only one leg, that’s nice! close to the beach nicer! My father has to carry Draculina with him all the time inside his cargo pants pocket or in his hands. With almost 32 celsius a cotton cargo pant over your legs with you underground ticket, sunglasses, some coins, home keys and dextrose pills is an extra weight and an extra power heater that you should better avoid, but my little bunnies, rules are rules!! 7:20 alarm clock, 8.10 underground, 8.40 a lot of people who is going to run an people who is accredited as organization are in the same underground train. The old man is getting nervous – a French couple asked him, an English guy asked him…where are we going to get our race number? – the beginning of the end ? 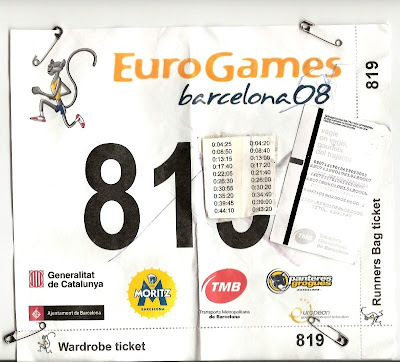 May be, normally you can get your number for the race the day after but in Eurogames 10k race you must present yourself one hour before. From the underground exit he was forced to run about 1.5 km to arrive 10 minutes before. Hahaha , he has used some energies – I was laughing in my bed. After 5,80 km nirvana arrived to Draculina and FB, they began to pass people on a very steady pace- but some tiny hills were on the last 2 kilometre- unfortunately he trained his last 21 on a hill and he was able to pass more runners and to lost almost 10 seconds arguing with Draculina before using his last forces to sprint at 14.5 kph the last 300 metres. Unfortunately me and Mother Bunny got lost but you can check his result here. He won with a 0:43:41 chrono. But still a 21,065 kms and a 42.195 kms are part of out bets. After an exhilarating journey Dan has arrived from Japan. 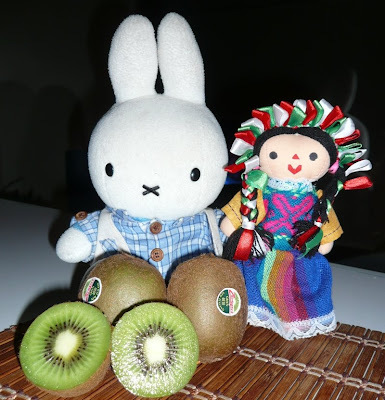 A noble Japanese family – The Cafemiffy clan– gave us the opportunity and the honours to train his body and soul for some time. The induction was very formal. Miffa used her Samurai outfit and her sword while Miffo acted as the secretary of the council. Draculina and Draco were present too. Dan swore loyalty to the Chan clan and Miffa – who overacted a little bit- nominated him as new knight of the clan. But What Doesn’t Kill You Only Makes You Stronger.